Lucca is a Tuscan city and one of the main art sites in Italy. Its historic walls, its alleys and squares are unique and fascinating. Lucca is an ideal location for engagement photography. 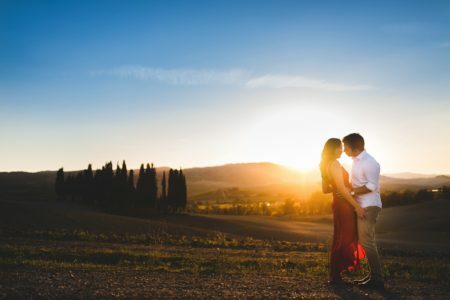 While choosing their wedding photographer, Giulia and Nicholas also considered an engagement photography session in Tuscany. I asked them if they already had a place in mind and they said that Lucca was their choice (an excellent choice!) I left the hills of Arezzo, where I live today, and after about one hour and a half I was in Lucca to meet the future spouses. After a small chat we headed toward Lucca’s historic center and started shooting. Shooting the engagement in Lucca was very enjoyable. We took a walk near the walls and through the streets of the city. While Giulia and Nicholas were cuddling, I was always looking for the best light: that magical light that together with the emotions and feelings of the two lovers, creates ethereal and timeless images. And between gardens, lanes and squares I have portrayed the feelings and the love of this beautiful couple. The engagement in Lucca will truly be one of their most beautiful memories! Giulia and Nicholas will shortly crown their dream at the Teatro dell’Olivo in Camaiore, Versilia. I am looking forward to tell you more about this beautiful love story! Continue to follow my stories!